Abby has provided this Martha Stewart all purpose cleaner review. I bought Martha Stewart's version of all purpose cleaner (also called a "multi-surface cleaner") because it was on sale and I wanted to try it. There is only one formulation of the all-purpose cleaner and it is a clear liquid in a clear bottle with the Martha Stewart Cleaning Products logo on the front. It has a light, almost citrus scent that disappears over time. I like that it is cruelty free, the packaging is recyclable, it is environmentally friendly. I used this cleaner to clean my appliances and counter tops, as well as the rest of my kitchen. It had an exceptional grease-cutting effect, and easily helped remove baked on tomato sauce from my cooktop with minimal scrubbing power. It did not scratch or damage any surfaces. The smell did not seem over-powering, either, since my daughter has asthma and I have a sensitive sense of smell. There is little I didn't like about this cleaner, and I would purchase it again. This cleaner is a bit pricey but not too bad for an environmentally-friendly product. Thanks Abby for sharing your Martha Stewart All Purpose Cleaner review. Abby also shared a review of the Martha Stewart bathroom cleaner here, if any readers are interested in that review as well. Does anyone else have a cleaner they really like to use in their kitchen? If so, share your natural kitchen cleaner reviews here, or read others already submitted. In addition, if you've used this, or any of the other Martha Stewart Clean products I would love to hear your reviews of them too. You can share your house cleaning supplies reviews here, telling me either about this brand or any other you like to use, and why. 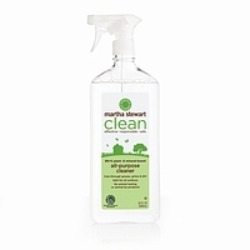 Misty has shared her review of this Martha Stewart Clean product. I used Martha Stewart's all-purpose cleaner and I got fantastic results. It did not have a smell so it did not irritate my nose. I used it in the kitchen, bathroom, living room, and bedroom. It cleans very well on many surfaces, including household appliances and floors. It makes every thing look clean without causing harm to it and gets rid of odors in the house. It even got rid of melted dry cheese, coffee stains, make up stains, and much more from my counter tops and sinks with out a problem. It also worked great removing mud tracked in the house from my dog onto my tile floor. The ingredients in the product are very organic and good for the environment, since it is more then 99% plant and mineral based. The price of the product is also reasonable, and it does an amazing job compared to all of those pricey cleaners. I would definitely recommend this product to any one. It has saved me hours of cleaning, all I need is a little bit of this cleaner and a wash cloth and the mess is gone! Thanks Misty for your review of Martha Stewart all purpose cleaner. Has anyone else used a general cleaning product like this that they've really enjoyed or had good results with? If so, please share your general purpose cleaner review here, or read other reviews that have already been submitted for even more brands. Janice shared this added benefit for this green cleaner. 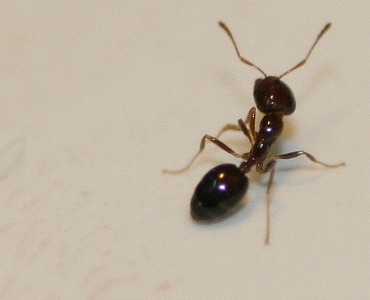 It is non-toxic around food/work surfaces BUT...I was delighted to see that it is INSTANT DEATH to those fast moving little ants that insist on checking the kitchen counter for some hint of food. How many insecticides would any of us use around food prep areas, with no worries? Zap! Thanks for sharing this tip Janice, although the fact that it hurts ants so bad makes me worry about it a bit! I'd love to hear from others who've used this product, to see if its worked for them in this way or not, and also how it has worked for more normal uses as well. In addition, you can share your home remedies for pest control here, or read others that have already been shared. I am a clean freak as well as a woman who has gone green. Recently, I was in the store, looking for cleaners to do some spring cleaning with. I picked up some essentials, plus this cleaner, which is plant and mineral based. My husband has seasonal allergies and has had breathing complications with some strong, scented cleaners that I have used in the past. I usually purchase all-purpose cleaners because of convenience and cost. I also prefer an all-purpose product for ease of use. I have reservations with new products. I have experienced cleaners that have damaged my wood, left streaks etc. My walls are constructed with white paneling, we use kerosene as our back up heat source, so I have a hard time keeping them clean. To get to the point, I sprayed a section of my walls with this product and to my amazement the dirt just poured off. As I finished this task, I stood back to admire my work. Not only were my walls sparkling clean, there were no strong, overpowering odor left behind. I would recommend this inexpensive, wonderful cleaning product to anyone. Thanks Bev for your review of Martha Stewart all purpose cleaner. Many people like all purpose cleaners for the exact reason you articulated -- that way they don't have to use so many different cleaners. If you are looking for a good all purpose cleaner, you can read reviews of general purpose cleaners here, or share your own review. Of course, if you want that is eco-friendly, I also have a page reserved for these as well. You can read natural all purpose household cleaners reviews here, or share your own as well. I used this, but was unhappy that it left a hazy film on everything. I had to go back and re-wipe with a dry cloth.